The kidneys are two bean-shaped organs that extract waste from the blood, balance body fluids, form urine, and aid in other important functions of the body. The kidneys reside against the back muscles in the upper abdominal cavity. They sit opposite each other on either side of the spine. Waste Excretion: The kidneys filter out toxins, excess salts, and urea, a nitrogen-based waste created by cell metabolism. Urea is synthesized in the liver and transported through the blood to the kidneys for removal. Water Level Balancing: Since the kidneys are key in the chemical breakdown of urine, they react to changes in the body's water level throughout the day. As water intake decreases, the kidneys adjust accordingly and leave water in the body instead of helping excrete it. Blood Pressure Regulation: The kidneys need constant pressure to filter the blood. When it drops too low, the kidneys increase pressure. One way is by producing a blood vessel constricting protein (angiotensin) that also signals the body to retain sodium and water. Both the constriction and retention help restore normal blood pressure. Red Blood Cell Regulation: When the kidneys don't get enough oxygen, they send out a distress call in the form of erythropoietin, a hormone that stimulates the bone marrow to produce more oxygen-carrying red blood cells. Acid Regulation: As cells metabolize, they produce acids. Foods we eat can either increase the acid in our body or neutralize it. In order to function properly the body must keep a healthy balance of these chemicals. The kidneys perform this job also. People can live with only one kidney and transplant surgeries with live donors are common in medical procedures today. 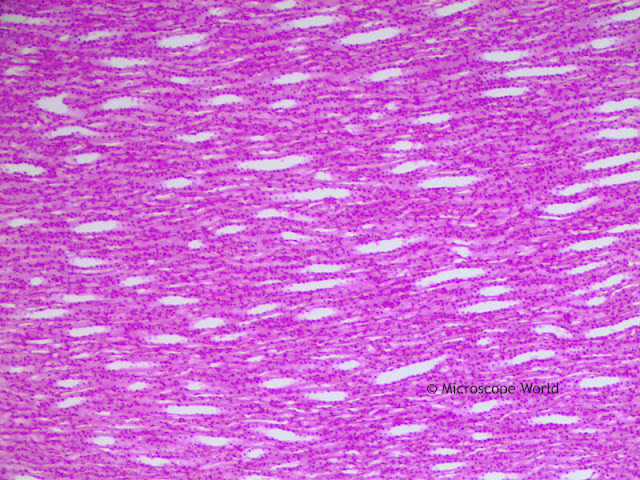 The kidney microscopy images below were captured under the Fein Optic RB30 lab microscope using a 5 megapixel CMOS camera. 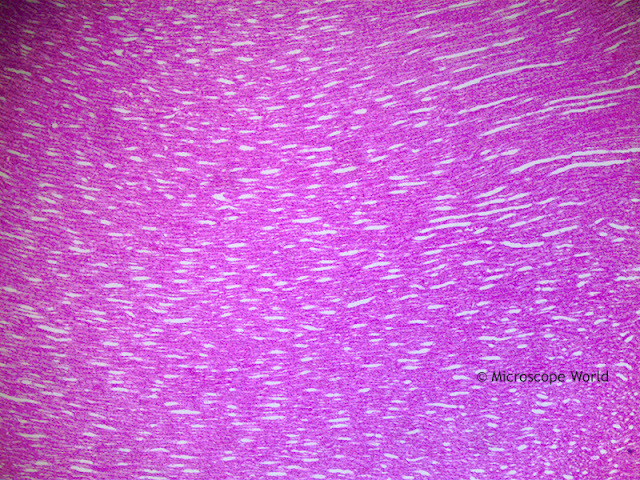 Kidney under the microscope at 40x. 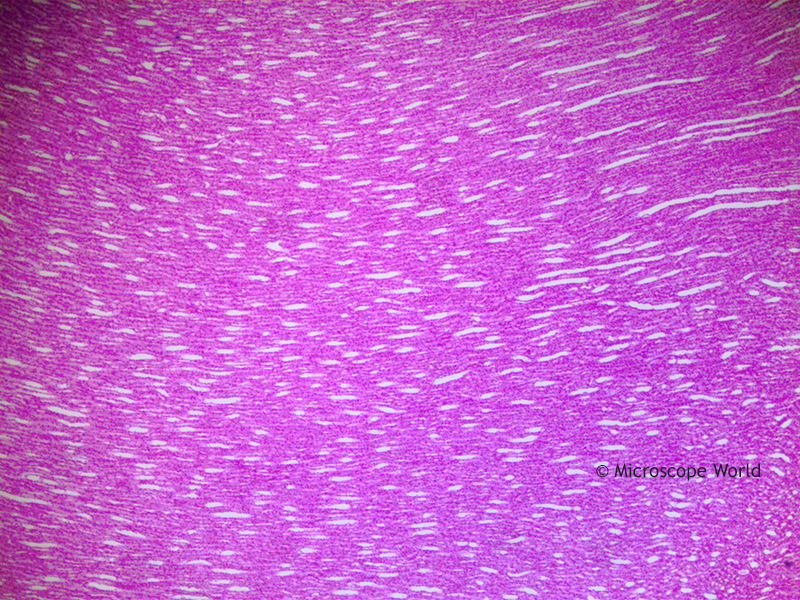 Kidney under the microscope at 100x. Kidney under the microscope at 400x. 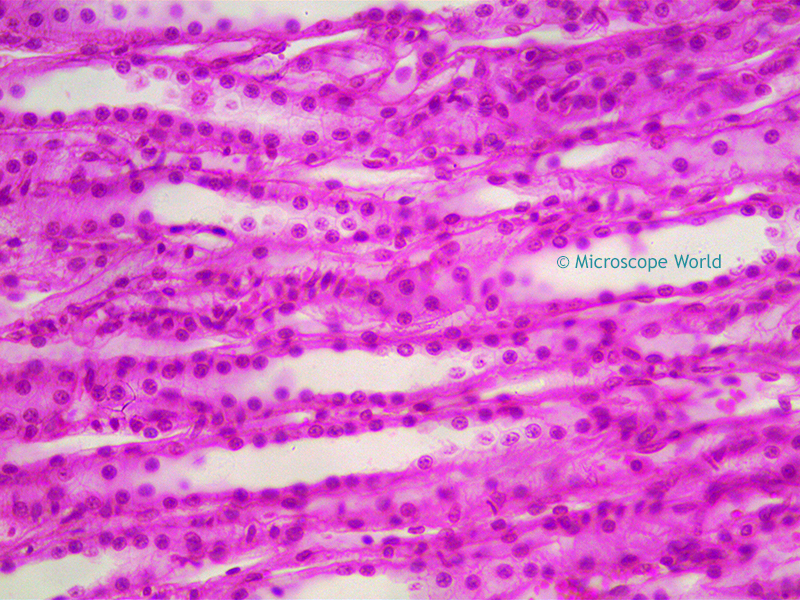 Contact Microscope World with questions regarding microscope systems and digital cameras.